Governor Charlie Baker and his wife, Lauren, attended a hometown inaugural reception at Swampscott Town Hall on Sunday. “I have to change your name to governor,” exclaimed Gene Barden, the 86-year-old former chairman of the Planning Board and a lifelong Democrat, shaking the hand of the governor he knew when Baker was a selectman in this town. “You just call me Charlie, all right?” Baker said, as his wife, Lauren, looked on. In this town of more than 13,700, with glittering views of the Atlantic Ocean and the distant Boston skyline, the new governor and his wife are simply “the Bakers,” residents of Monument Avenue, a short walk to the red-brick Town Hall. Sunday’s event — billed as a hometown inaugural — was more like a wedding reception than a political celebration, with more than 350 well-wishers eager to hug, shake hands with, or high-five the new governor. Though raised in Needham, Baker has lived for more than 20 years in Swampscott, a historic former fishing village settled in 1629. He and Laurenraised three children here and cheered on the sidelines of soccer and football games with many of the bundled-up townsfolk who congratulated him on a chilly Sunday. Dressed in a jacket, an open-necked shirt, jeans, and hiking boots, Baker thanked the town not so much for their political support — “although we got a ton” — but for being good neighbors. Baker won 61 percent of the vote in Swampscott. In the line, residents beamed. Matthew Strauss, chairman of the Board of Selectmen, presented Baker with the key to the town. Brownie troop 86303, in full regalia, gave him two boxes of Girl Scout cookies. Democrats stood nearby in the receiving line, including state Senator Thomas McGee, the chairman of the Massachusetts Democratic Committee, and local state Representative Lori Ehrlich. Not everyone in line voted for Baker — or had nice things to say about Republicans. Maritza Gilmore, a Swampscott native who now lives in Peabody, carried her sweater-clad Yorkshire Terrier, Bella. “The dog is a Democrat,” Gilmore said, half-joking. “If she was a Republican, she might bite.” Still, Gilmore greeted Baker affably. 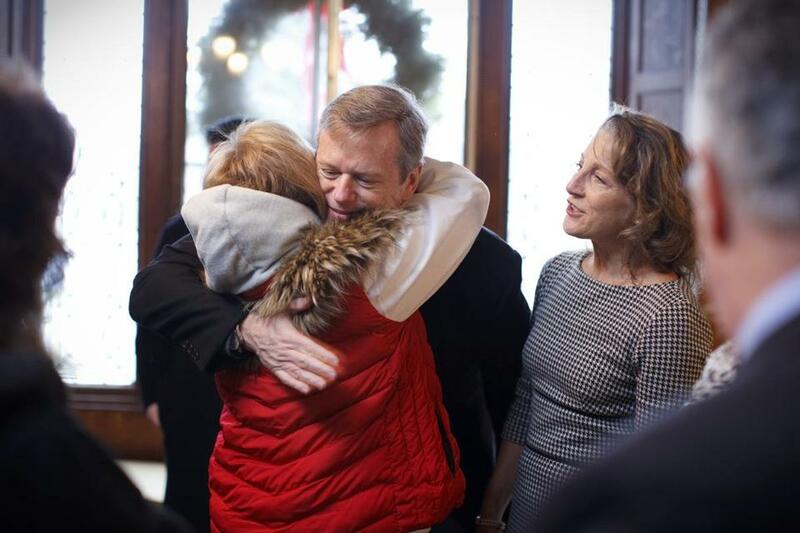 For more than two hours, Baker embraced Republicans and Democrats alike. He chatted and posed for photos in a small room in the historic town hall, near a seal depicting a fishing boat and captain, and told aides not to shut anyone out. Lauren fell to her knees to greet schoolchildren she has known since they were toddlers. Baker even coaxed a bashful immigrant from Italy into posing with him. “You want to take a picture?” he asked Vanda Stati, who didn’t want to cause a bother. “Come on,” he said. At one point an aide offered him some hand sanitizer. Baker shrugged. At times, the mood turned somber. Some praised Baker for declaring a hiring freeze when Massachusetts faces a budget deficit. Others thanked him for making the state’s opiate addiction crisis a priority in his inaugural speech, though Baker has admitted that he flubbed some details in that speech about the fatal overdose of Easton teen Evan Greene last year. In the speech, the governor said the 19-year-old became addicted through medicine prescribed by a doctor. But family members said Greene was introduced to the drug through a friend. In remarks to the media after Sunday’s reception, Baker again apologized for the error — and to the Greene family, though they had already forgiven him. Baker said he hoped the error wouldn’t distract from his larger goal of swiftly addressing the crisis, which has claimed lives across the state. The governor said some people even told him personal stories about the crisis on Sunday. Baker left Town Hall on an upbeat note, celebrating the New England Patriots’ win Saturday over the Baltimore Ravens, which won him a bag of Maryland crabs from the governor-elect of that state. Since Baker is allergic to shellfish, he said he would pass them to someone else. Baker also dodged a question about which town is better — his native Needham or his adopted town Swampscott.